New iPad models are expected to launch later today at Apple’s event — we’ll be live blogging it here — but there’s clearly lots of life left in the older and current iPads. 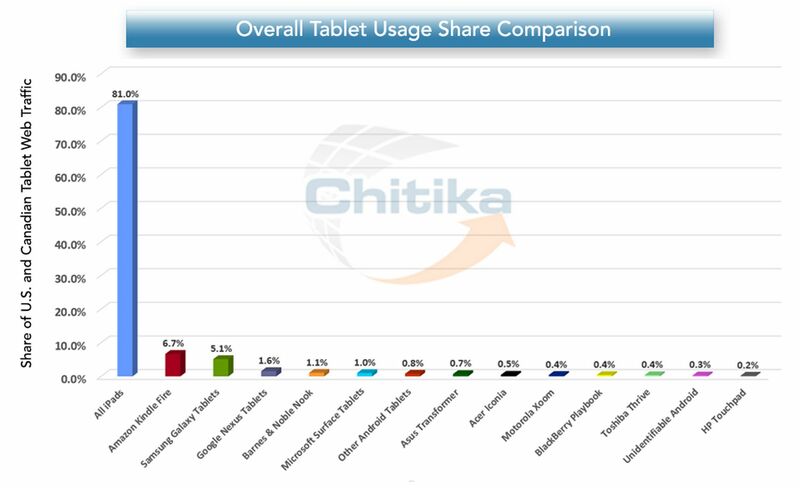 On Monday, we heard that the iPad 2 is Apple’s most popular slate and on Tuesday, Chitika noted that iPads account for 81 percent of web traffic on all tablets in North America. I’m not surprised that the iPad is the most used tablet: For many consumers, iPad is synonymous with the word “tablet”. I do wonder how skewed the data may be when looking at the other tablets, however. For example, Google Nexus tablets only generated four times more traffic than the old Motorola Xoom and only eight times more traffic than the doomed HP Touchpad. That suggests to me that Chitika’s ad network, which is where this data comes from, may be weighted with more ad customers on iOS devices compared to those on Android. Regardless, there’s plenty of additional evidence that the iPad is still the king of tablets for many. And depending on what Apple announces later today, its reign is likely to last even longer.